Prevention is always better then cure. And, brushing and flossing alone won’t help prevent potential issues with your teeth. That’s why at Battery Hill Dental, we provide an essential step in maintaining the optimal health of your teeth and gums with detailed holistic examinations and regular cleaning of your teeth. Our holistic comprehensive examination allows us to gather information about your teeth, gums, bite, and its overall connection to your health. Increasingly, evidence is showing the connection between issues with your mouth and systemic issues like heart problems, diabetes, and prenatal issues to name a few. A good examination allows us to work together to craft personalised care to take care of your teeth, and also your health. Why Do I Need a Dental Clean? A professional dental clean is an essential component of good oral health. The 'white stuff' people see building up behind their lower front teeth is called tartar/calculus; and it builds up every where, particularly between your molars. Calculus contains significant numbers of bacteria that fester and can cause a gum disease called Periodontal Disease. Periodontal disease is the main reason for loss of teeth, and worst of all, it isn't painful until it is too late; so people don't even realise they have it sometimes. Additionally, periodontal disease is like having a large infected ulcer on your arm, but it's just hidden in the mouth. It isn't good for your teeth, but an infected ulcer is not good for your overall health either. Fortunately, with regular cleans every 6 months, this significantly reduces any damage this can cause. This is one of the most important parts of dental care you can receive. Have your dental cleaning and exam today! Good oral health contributes to good overall health. Our dentists will work with you to create personalised dental care and will aim to empower you to create good oral habits that you can practice at home. Check out our prices for dental cleans at Battery Hill Dental, your local Sunshine Coast dentist. Save money in the long run as you protect your teeth, gums, and overall oral health. Having regular exams and cleaning helps you avoid potential problems that requires more costly and more complex procedures. It might cost you $200-$300 every year, but it will prevent you spending thousands of dollars in the future. What happens in a dental consultation? During a dental consultation, your dentist will gather information about your health, concerns, oral hygiene habits and history. Your face, mouth, and teeth will also be examined for abnormalities and signs of decay, such as gum swelling and redness. Your teeth and gums will also be checked for evidence of tooth grinding, misalignment, and gum disease. Your dentist will also examine your palate, tongue, inner cheeks, lymph glands and neck for signs of infection or cancer. Photos and x-rays will be taken for comprehensive records and diagnoses. After the collection of all the information, the results will be discussed with you in ways you'll actually understand so a personalised treatment can be formulated if necessary. Is it painful to have your teeth cleaned? The better your oral health, the less painful teeth cleanings are. Teeth cleanings can be uncomfortable if you’re not in the habit of thoroughly brushing and flossing your teeth. Flossing is important as it cleans off 40% of the plaque from your teeth, so not regularly doing this creates build up that becomes harder to clean. However, we utilise the latest technology which significantly reduces discomfort during cleaning. Why do my gums bleed during cleaning? Gums bleed because they are inflammed. The gums will bleed when dental cleaning tools come in contact with inflammed gums, which is caused by calculus, which harbours bacteria. Scaling the teeth uses special tools that removes calculus and plaque in areas that normal tooth brushing can’t reach or remove. While cleaning may cause discomfort and bleeding, your teeth will be healthier afterwards. During the cleaning, your dentist or dental hygienist will use a small metal instrument called a scaler to scrape off tartar build-up above and below the gum line. Then a small, ultrasonic device will loosen up plaque and tartar from your teeth, which is rinsed away with a small jet stream of water. Your teeth will then be polished with a lightly abrasive paste so that it will be more difficult for plaque to accumulate until your next cleaning. Why does my teeth feel sensitive after cleaning? Along with bleeding, you may also feel teeth sensitivity during and after your cleaning or prophylaxis. These are normal because the dentist’s cleaning tools do a great job in creating a clean surface. This clean surface is like having a clean shaven face; it's going to be a little sensitive until it roughens back up. 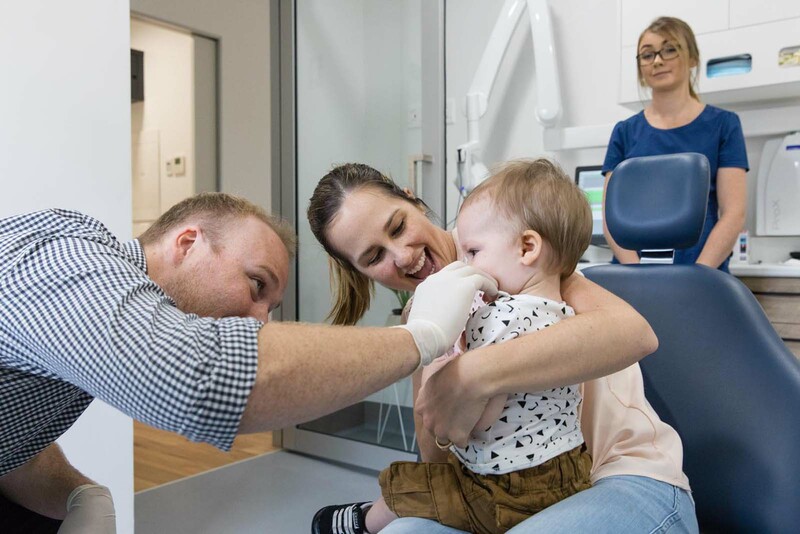 Looking for Dental Cleaning and Examinations in Caloundra? Look no more. Battery Hill Dental will take care of all your family dental needs, for you and your family.